CBS picked up some steam as we head into the tail end of the season. CBS: It was a very solid night for the network, with upticks for every show in the line-up: 0.2 for BIG BANG THEORY (to 3.7), MOM (to 2.2), and ELEMENTARY (to 1.4), and 0.1 for THE ODD COUPLE (to 2.2). 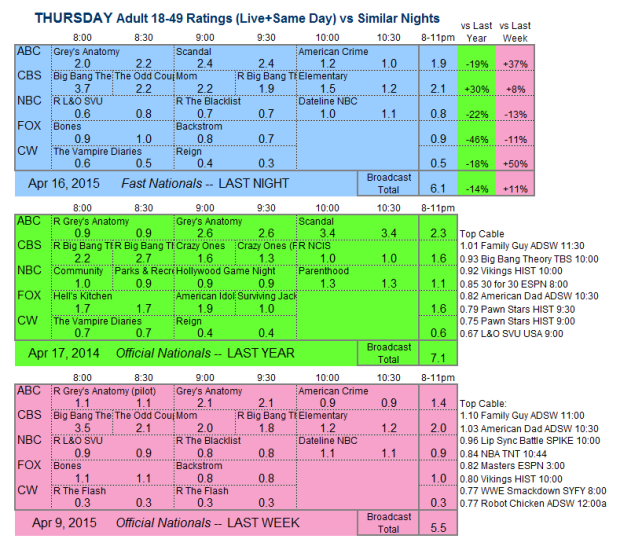 The night’s BIG BANG THEORY rerun was also up 0.1 from last week to 1.9. ABC: GREY’S ANATOMY, back in its 8PM slot, held onto last week’s 2.1. SCANDAL returned with a 0.3 bump to 2.4. AMERICAN CRIME gained 0.2 to 1.1. 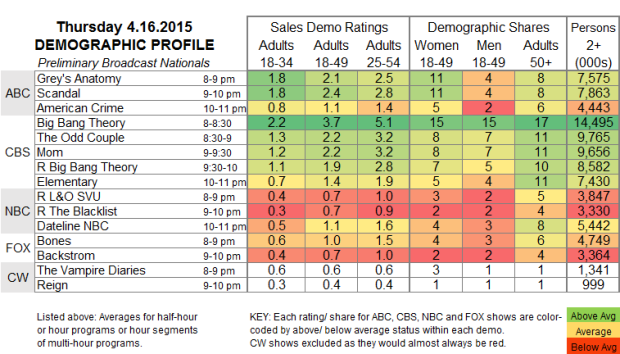 CW: THE VAMPIRE DIARIES fell 0.1, back to its series low 0.6, and REIGN gained 0.1 to 0.4. FOX: BONES and BACKSTROM each lost 0.1, respectively to 1.0 (a series low for BONES) and 0.7. NBC: Only DATELINE was new last night, steady at 1.1. It was preceded by SVU and THE BLACKLIST reruns at twin 0.7s. CW just barely qualifies THE MESSENGERS as a regular season series with tonight’s premiere. Meanwhile, ABC beats the first drums for the end of the season by airing the finales of LAST MAN STANDING and CRISTELA. CBS has a 2-hour THE AMAZING RACE on the schedule.